Patricia Roy, D.O. - Dr. Patricia Roy, D.O. Doctor Patricia Roy was born in Muskegon and has lived here all of her life, except to attend college and medical school. She attended Sacred Heart Elementary School, and graduated from Catholic Central High School. She continued her education at the University of Michigan and Aquinas College in Grand Rapids. 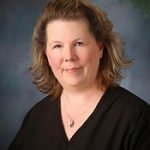 Dr. Roy attended medical school at Michigan State University College of Osteopathic Medicine, and did her post-graduate training at the former Muskegon General Hospital, which is now Mercy Health Muskegon. She is honored to be a part of the clinical faculty at Michigan State, Grand Valley, and Wayne State University. Dr. Roy sees patients in the office every Monday, Tuesday, Wednesday and Friday, and every third Saturday morning. One of Dr. Roy’s greatest pleasures in Family Practice is being able to care for multiple members of the same family, some of which include family members from five generations. Dr. Roy and her husband, Paul, have been married for 36 years. He is a retired administrator for the County of Muskegon. They have one daughter, Jennifer, born in 1982, who works in education in Phoenix, training teachers to intervene with students who have behavior problems. Dr. Roy and her husband live in Laketon Township, which is located in the Reeths Puffer Schools district.